For people fueled with passion, time is always the enemy. It was my first time interviewing the Queen of All Media at her first Bloggers Conference for Star Cinema's Etiquette for Mistresses. Directed by the award-winning Chito Rono with fellow big stars Iza Calzado, Claudine Barretto, Kim Chiu, Cheena Crab, Kris Aquino experienced a fun chat with us at the Training Room of ABS-CBN last Wednesday. So while I was giggling about fellow bloggers updating on issues of the day, the crowd went silent and gazed at the divine presence of a lady in beautiful checkered blue dress. She was eloquent in class and in style. When she started explaining how she will undergo a medical check-up the following day because her blood pressure went up, I remembered how I had also questioned myself for working too hard and having the same experience. Not having enough sleep is indeed a serious problem that'll take a toll on you. The expensive bags and details of production design was intended to get close to adaptation of the book written by Julie Yap-Daza. She was apologetic to Star Cinema staff regarding the choices of location because she intended to provide the movie-goer an unforgettable experience. Kris had become impeccably luminescent of wisdom. This is what I believe the reason why we love her - being one of the richest with such transcendent honesty. She goes through circumstances and survives every battle without crass. This is a culmination of all mistresses movies we've all watched according to Kris and it is recommended for the husbands and the wives to better understand what true love is. I've been a fan for a long time and it is her constant flame of passion that also kept me going in and out of love. 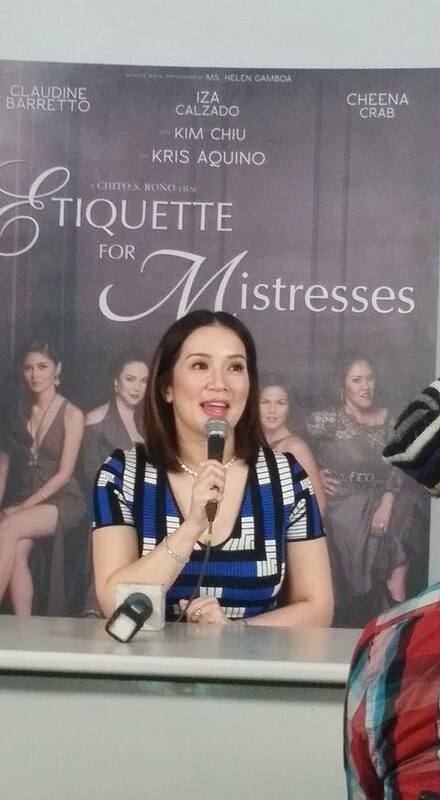 She was giving hints of how real the characters are in Etiquette For Mistresses without dropping names. 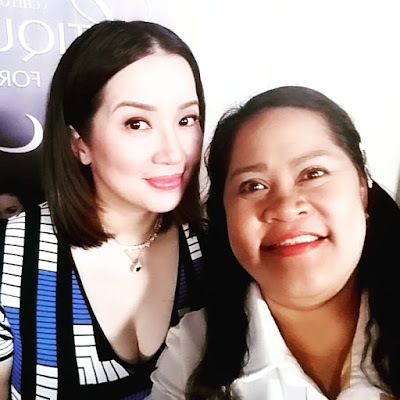 Kris Aquino had definitely evolved into a mature icon we will continue to love. The bloggers were all happy about the opportunity to have selfies during the end of the talk and to our surprise, because she wasn't able to deliver the promise of showing us the BTS of the movie, she rose announcing she'll give away phones. I was lucky to have won one Samsung S6 Edge Plus, a gift I will definitely use for more blogging events. For years of covering events with Kris, this is the first time I won in the raffle. Thank you Ms. Kris Aquino, Star Cinema and ABS-CBN! It's always great to be a Kapamilya. I wanted to ask more questions like what she can still share about the mistresses culture we adopted from China, her opinion and suggestions about screenplay and if she will also share her health tips on IG or on KrisTV. I have so much awe at her choices in life and in love. "I would choose to be the man because the man has a choice"- Kris Aquino said when asked what tip is best to follow on Etiquette For Mistresses. I hope and I will definitely pray that you feel better Ms. Kris because you are one personality we need to lift the hearts of the broken, to believe in hope and in love despite all odds. Thank you again for the gift of wisdom and gratitude. I will definitely watch Etiquette For Mistresses on September 30. 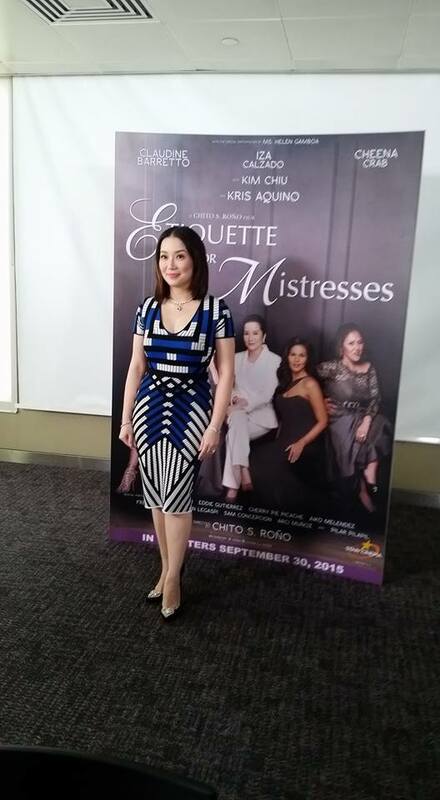 It's also showing in other parts of the world so visit Ms. Kris' Instagram @withlovekrisaquino for details. For more information, please visit www.starcinema.com.ph and like https://www.facebook.com/StarCinema and follow @starcinema on Instagram and Twitter for more updates.